2017-18 Federal Budget - what is in store for you? The 2017-2018 Australian Federal Budget has been announced. What are the outcomes for this budget? 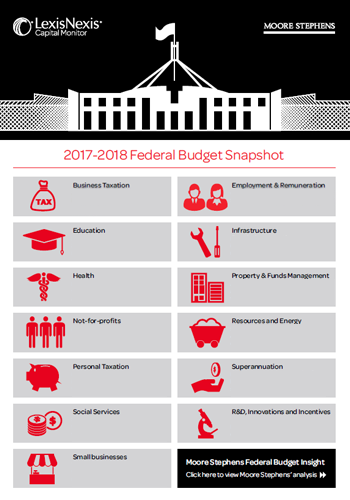 Moore Stephens together with LexisNexis Capital Monitor have summarised and provided expert analysis of the 2017-2018 Federal Budget outcomes. Our team of tax experts working alongside LexisNexis Capital Monitor’s editorial team were in the Australian Parliament Budget lock up sifting through the information and preparing our expert analysis to get it to you first. Click on the topics below to read about the key outcomes. Download your copy of our budget snapshot for all you need to know about this years announcement.